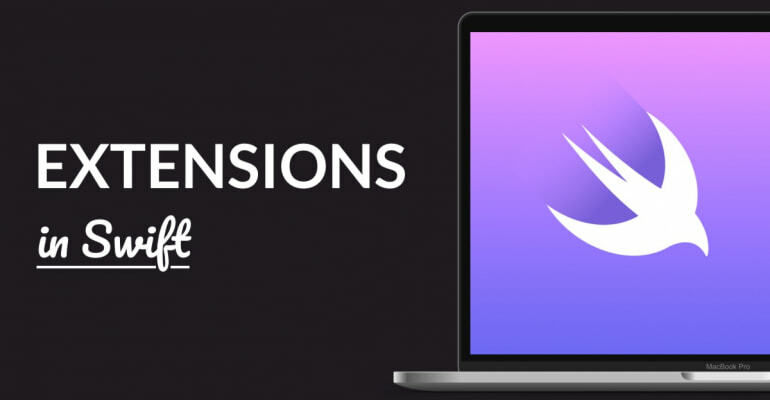 Extensions in Swift are super powerful, because they help you organize your code better. You use an extension to add new functionality to an existing class. And they’re especially useful if you don’t have access to the original code of that class! With an extension you can add new functionality to an existing Swift class, structure, enumeration or protocol type. You can literally add on new functions to an existing class, even if you don’t have access to the original source code of that class. That other developer decided to measure the airplane’s altitude in feet, but you want to set it in meters. You can’t edit their code, and you don’t want to subclass Airplane, so you create a Swift extension instead. So, what’s really going on here? When your Swift code compiles, any extensions you’ve defined are added to their respective classes. The original class and its extensions are essentially merged into one. As a result, you can extend a class with new functionality, such as functions. Why not? Adding a new property to a class, with an extension, would fundamentally change the structure and needed memory of that class. And we already have a superb way to change the structure of a class: subclassing. A powerful way to use extensions is separating and grouping different parts of a class. You use a base class for the fundamental code of the class, such as its properties, and then add on functions by using extensions. Each extension can have its own Swift file. When you organize a class based on its functionality, and don’t put it all in one file, you can have greater control over where you put what code. Consider for instance that you’re coding a view controller. The view controller has two main features. You can put each of those features in its own extension, and still use the view controller as one complete class. The example with the Airplane is of course trivial, but you can imagine that breaking up components in extensions can help you organize a larger code base better. The key is to think about how to organize your code. An approach to start with, would be organizing your code by functionality. When a class conforms to multiple protocols, its class declaration can get messy quickly. And you end up with a huge class, which is generally a bad thing. Just as with the previous example, you can break up and group a classes code by putting the functionality of each protocol into its own extension. The extension makes the base class adopt a protocol, and you add protocol-specific code to the extension. Always keep in mind though that extensions shouldn’t be an excuse to skimp on proper app architecture. A huge class separated in 10 extensions is still a huge class, no matter how you slice it. You can’t add properties to an extension, but you can add static constants and subtypes to extensions. And that lets you do some Swift magic! The post(name:object:) function expects a value of type Notification.Name as its first parameter. You’ve defined the constant statusUpdated on Notification.Name, so Swift will infer its type, and you can use the shorter .statusUpdated syntax. static let useSync  = "use_sync"
static let lastSync = "last_sync"
The Keys subtype is only available on the UserDefaults type, which means that you won’t have an arbitrary struct defined at a global level in your code. This is similar to class-level namespacing in other programming languages – something that Swift cannot do. The use of constants simply means that you’re less likely to make errors when typing "use_sync" for the UserDefaults key. You can use the same concept anywhere you use static keys. Swift is a super useful programming language, but sometimes it just doesn’t have what you need. Consider for instance that prior to Swift 4.2, arrays had no simple shuffled() function to randomize arrays. It’s lunacy to subclass arrays just to be able to randomize them, so you resort to using a global helper function. The above code merely adds a shuffled() function to the Array type. As a result, that function is available on any array. Neat! The above code first declares a Circle class, and then adds a circumference computed property with an extension. When a computed property is accessed (see below), the code within the squiggly brackets is executed and a value is returned. Again, a trivial example, but imagine you don’t have access to the source code of the original Circle class, or that you want to organize its functionality better. The last approach we’ll discuss is using protocol extension. Unlike protocol conformance (see above), protocol extensions let you directly extend a protocol. What’s really mind-boggling is that you can provide default implementations of protocols by using extensions. See how we’re calling the eat() function on apple, even though the Apple class does not provide an implementation? That’s because of the default implementation from the protocol extension. Awesome! Extensions increase the composability of your code, they let you add functionality to classes you can’t change, and help you organize your code better. And they’re downright awesome!